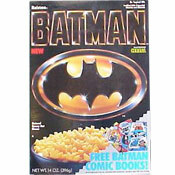 This limited edition cereal was described on the front of the box as a "crunchy sweetened basketball shaped corn cereal". 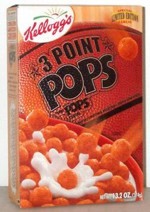 The box featured a huge basketball and a bowl of the cereal with pieces shooting in - complete with orange jet streams. The cereal pieces were essentially Pops cereal with orange coloring. To refer to the pieces as "basketball shaped" essentially means that any round cereal could be considered basketball shaped. Quaker pulled the same stunt with U.S. Soccer Golden Goals Cereal in 1999 referring to its Kix-style pieces as "mini soccer balls". The box that we were lucky to get could transform into a shoot-the-cereal basketball game. You'd cut out a graphic of a net from the side of the box, curve it and stick it into slots on the back of the box. 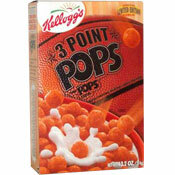 Then you were instructed to "use your 3 Point Pops cereal, step back and take 10 shots." The texture of the basketball on the front of the box had a texture vaguely similar to the feel of a real basketball with many tiny raised bumps. The first 12 ingredients listed on the nutrition panel were corn meal, sugar, corn syrup, molasses, oat flour, baking soda, salt, sodium ascorbate and ascorbic acid (vitamin C), niacinamide, yellow #6, zinc oxide and reduced iron. 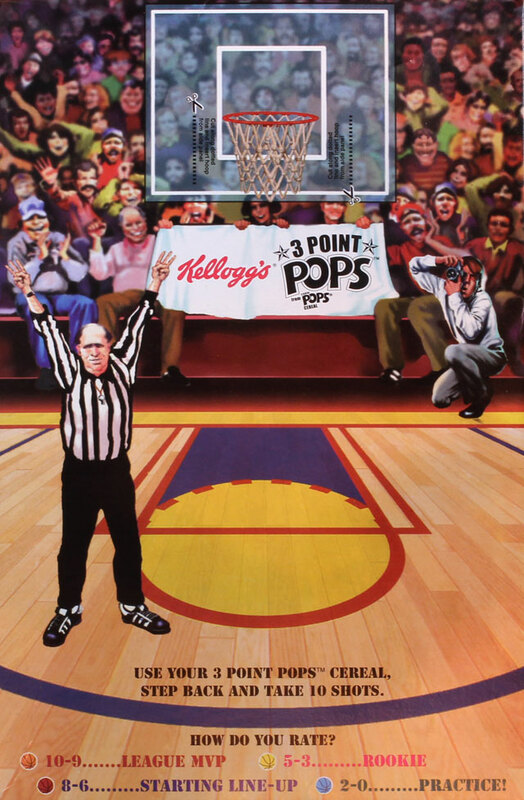 It's interesting to note that General Mills introduced a basketball shaped cereal called Dunk-A-Balls in 1993. Those cereal pieces looked more like basketballs because they had etching that looked the lines (or ribs) on a basketball. A football shaped cereal was introduced by General Mills in 1994 in the form of Quarterback Crunch. What do you think of 3 Point Pops? The commenter that says this ain't a good cereal needs to rethink it. 3 Point Pops had a distinct taste. I ate them religiously back around the time Teletubbies was a huge hit. 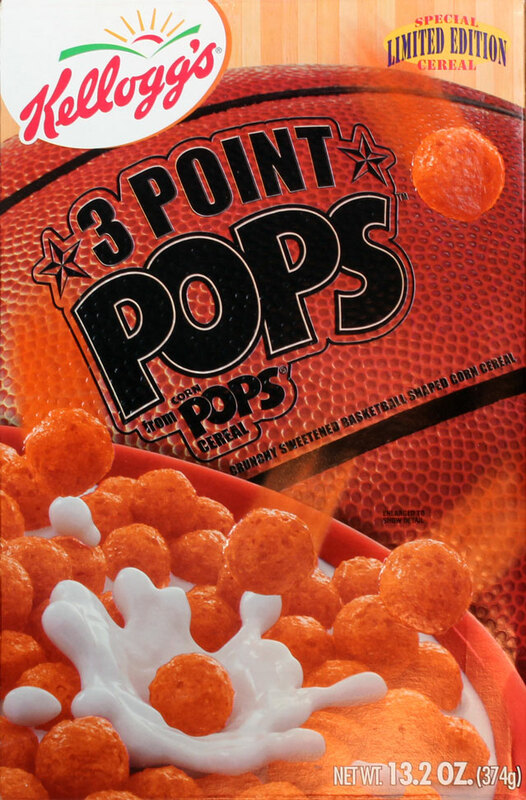 In fact, every day with 3 Point Pops was the same that all my memories of it remain unified in my brain. Nostalgia tells me it's the greatest cereal ever made. In 2011, they were saying that the company was thinking of discontinuing Corn Pops, because it wasn't selling. Now it's considered one of the top 15 sellers in cereal. They need to make up their minds. Now they come up with this garbage. It's the same thing, but with added food coloring. I bet most idiot parents out there are whining about vaccinations, but they'll feed their kids this colored crap. Buy the plain stuff and don't worry about pleasing your whiny kids.